1. 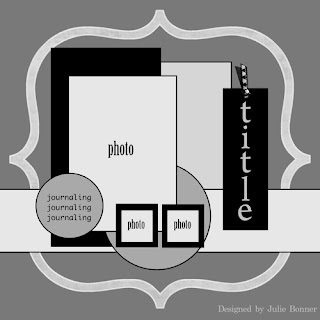 The purpose of this project is to scrapbook about yourself. You have to have a picture of yourself on the layout, and the layout has to be about you, what you like, what you dislike, etc. 2. The journaling. We want to learn something about you. The journaling doesn’t have to be lengthy, but it needs to be there. 3 Go! Create! 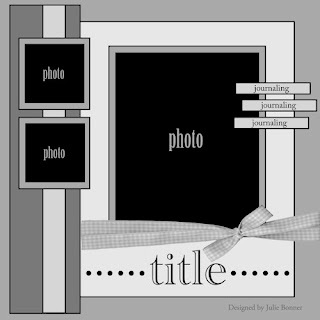 Your layout can be any size, 8 x 8, 6 x 12, 8.5 x 11 or 12 x 12. It’s up to you. Picture, of course. Embellishments, sure. Journaling, YES. 4. The layout MUST BE NEW. So here is my layout! 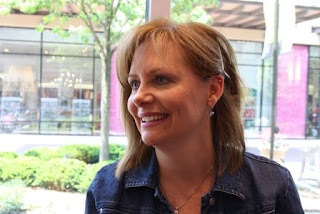 My journaling reads: As my kids get older, one of my goals is to stay involved in their lives. Sometimes this means that I have to do things I wouldn't normally do. Over the past couple of years I have been introduced to tubing. Yes, I am 42 years old and I go tubing several times a week! My kids love it! This challenge was great fun! I used papers from Flair Designs. I added Glossy Accents and Stickles to my title and the waves. A bit of bling, a flower and voila!!!!!! Here are a couple of close-ups of the border and flower element. At the beginning of every month we put together a small kit of materials and run a challenge. It has been great fun to watch everyone start with the same items and see what is created. 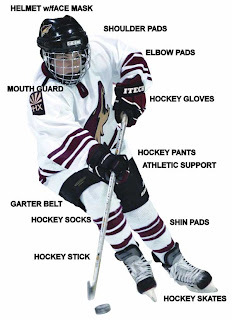 This is a photo of some of the items that were included in our kit. We are allowed to add anything we want, but we have to use a little something from everything in the bag. These photos were taken 4 years ago. 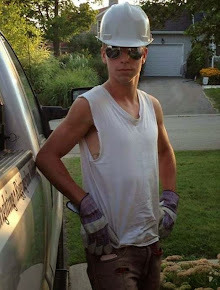 Matt, my youngest son, was trying so hard to master a jump on his skateboard. He ended up taking quite a wipe out and cutting his elbow, but that is for another layout. Everything is from the kit except the red floss that I used for the stitching, the letter stickers from Scenic Route, a piece of red cardstock to mat my photo and I cut the flourish using the Graphically Speaking Cricut cartridge. We are working on the project kit for July! They sold out so fast for June so we are preparing extras this month. I have been so busy lately, but I did manage to fit in the Use It! challenge. I love these challenges because they are so quick and easy. I always love how my creations turn out. My pattern paper is from KI Memories (I think, it has been around for awhile). The chipboard is from Maya Road. The paint is Making Memories celery and Ranger butterscotch. The rub-on is from Basic Grey (it went on a little sideways, but it was the only one I had). I had to use the foam dots. They are one of my favourite things to add. I raised the chipboard flowers and the rub-on. Thanks Rosanne! It was a fun challenge. 15. Store to clothes shop - I don't have a favourite, is that wierd? I just wanted to add that I love hockey just as much as I love scrapbooking. There wasn't a question to reflect this, so I just wanted to make this clear. Everyone's blog that I went to had a photo of flowers at the top. I switched things up. I hope that wasn't againt the rules. Your turn. If you play, just leave a message and link in the comments. I would love to see your favorites! as much as the finished card! Here is my card! 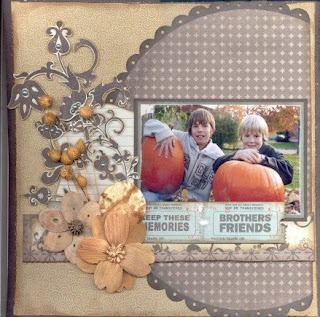 I used scraps that I had leftover from a layout that I did. They are from the Breaking Free line from MME! 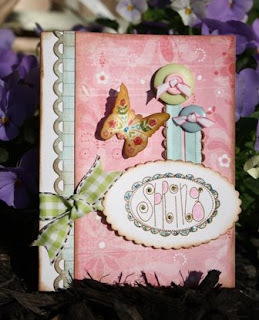 My tag was created using a stamp from 7 Gypsies and I used my corner rounder to make my scalloped edge. Thanks for the great challenge Joanne! Now I have another card to add to my collection. It was great fun. I have a little basket that sits on a three tier cart near my table with the tools I always reach for ~ my Crop a dile, my date stamp, fiskars punches etc. Anyone else have one of these 'happy go lucky' baskets nearby your table for easy access? Well Shelby posted a photo of her set-up. I immediately zoomed in on the little clear tubs in the lower right corner of her photo. She got them at Ikea. That is all she had to say......the next day I jumped in my car and off we went to get some! Amanda came with me and the first thing we did when we arrived was went right upstairs to the restaurant. We enjoyed a delicious lunch and then we did the walk through the entire store. I love visiting Ikea. Each little room holds so many interesting things. Eventually we got down to business and located the items we came for. 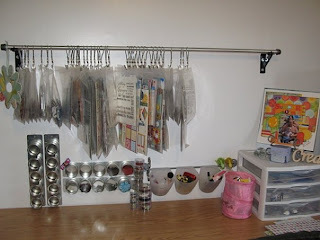 Just a few hours later I had my hubby install them for me and I filled them up with all the items that I reach for every time I scrapbook. I even started creating a layout to try everything out. I would like to thank Shelby for showing me these amazing little bins. I spent a total of $15.71 for the hardware and 8 of the bins (this doesn't include the $25 in gas or the $15 for lunch). They are my new favourite thing in my scrapbook space. Visit our forum for many other inspiring ideas! Life has been great lately in my scrapbooking world. I recently went on a girls weekend and then, here it is, only 2 weeks later and I had 12 hours of scrapbooking in St. Jacobs at the Schoolhouse Theater for Crop for the Cure. Joanne and I have attended this event for the past 2 or 3 years and it is always nice to get out and hang out with my friends. I think almost everyone in the room were customers of ours, which was really nice to see. So after 12 hours, you would expect lots of layouts right? Well, I did 2 single page layouts, and a card. I also put the finishing touches on a third single page, but really it wasn't much. It was a very low key, non stressful day. My Grandbend layout was created using the Breaking Free line from My Minds Eye. I also used chipboard letters from Maya Road. 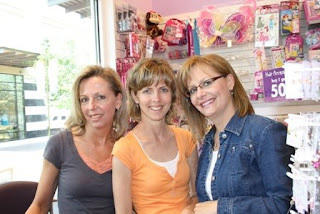 We were all having a great time using the Tattered Angels mists. Karan and Joanne were even giving demos outside on the steps. It was fun. This layout is a mix of stuff. Papers from Crate Paper and Breaking Free, and tickets from Breaking Free. The coolest were the flowers from Prima that Karan lent me from her stash. I had seen them before, but didn't quite know what to do with them. With a little guidance from Karan and Joanne they worked out great. We will be ordering these for the store for sure. The last layout was created for my submission for the 52 Sketches 52 Weeks weekly sketch challenge. This is sketch #22 and I had a lot of fun working with it. This is my take on it. I used photos that were 4 years old. It was great reflection time and I am very pleased with the results. Everytime I walk by my scrapbook desk I stop and look at it. That is how I know I am happy with my creation. This week I have to get going on my Scrapper's Island challenge and I have the June product challenge kit too. Hopefully I will have another productive week and I will post my creations when they are done. Thanks for looking! 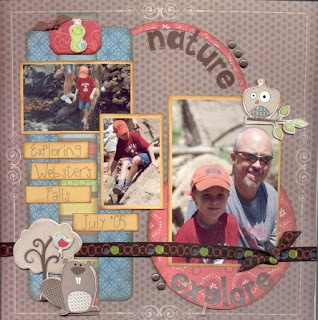 I have been doing a lot of scrapbooking lately. I have been having so much fun. The mojo is flowing and I am just running with it. Hopefully it keeps up and I can continue to enjoy my favourite hobby. I have found some sketch blogs that I really like and here is a sketch that I recently tried from 52 Sketches 52 Weeks. And here is my take on it. I love how it turned out. I had it out on my desk for days, just so I could look at it. All the papers are from Cosmo Cricket's Lil Man collection and the scalloped paper is from Jenni Bowlin. The letter stickers are from Jenni Bowlin and Doodlebug. 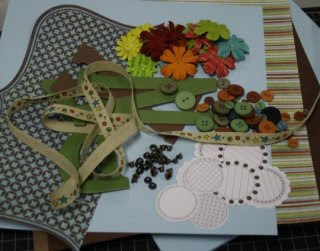 The buttons and ribbon were from my stash and I used the Upper Crest border punch from Fiskars. I am participating in the 2 Sketches 4 You Ultimate Card Showdown. 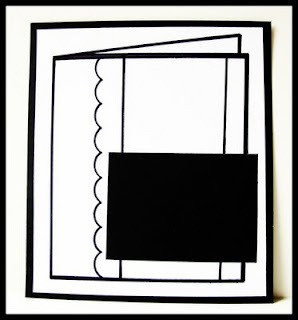 If you are a card maker, you need to check it out. The competition is stiff, but I am up for the challenge. We are to make the most stunning card ever, based on this sketch. Here is my take on the sketch. 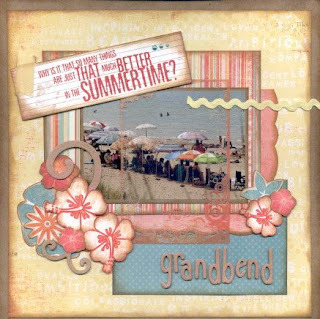 The pattern papers are from Basic Grey (Urban Prairie), stamp is from Pink Paislee (Spring Fling), ribbon is from Making Memories, Fiskars border punch, Ranger Distress Ink and buttons from my stash. I also used Stickles for a little sparkle. I have my fingers crossed!! To Pierce.......or not to pierce? 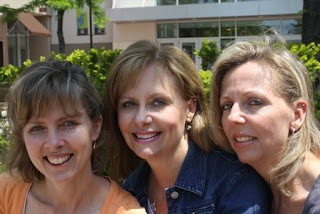 A couple of weekends ago I headed out of town with my BFF to visit Mary for a girls weekend. We had barely arrived and Joanne told me they had something special planned.......I thought right away......we are going for a pedicure! Yuck. I don't like the idea of someone touching my feet. I have never had one done, but it just doesn't appeal to me. Both Mary and Joanne broke out into hysterical laughter and told me that wasn't the plan. 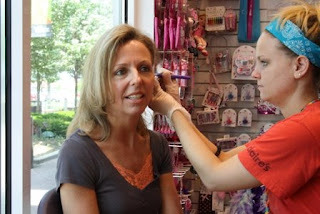 Instead, she wanted to get a third ear piercing in the upper part of her ear....and she wanted me to join in. I willingly agreed to join them. I thought it would be fun..............read on to find out how it went. 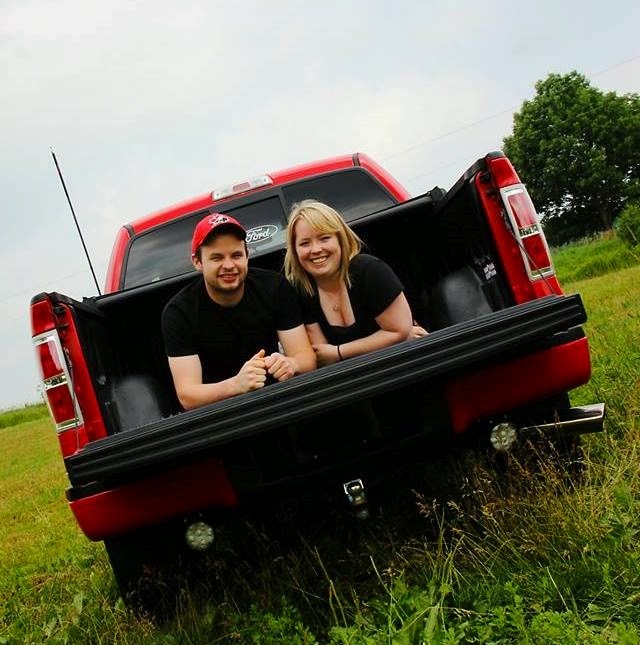 Here is our before photo. We all look happy and excited to embark on this new adventure. We all exposed our ear in the photo so that we could do a shot after the piercing to show the difference before and after. 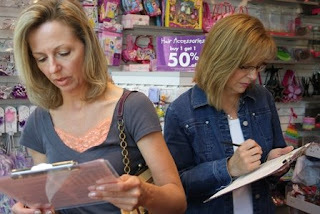 Mary and Joanne are filling out the forms, which were very long and required many initials and signatures. This is Sam. She is the girl that was going to do the proceedure. She kept telling me that she didn't want to have her photo taken, but I am a scrapbooker and I needed a photo of her for the layout I am planning to do on this experience. Besides, I noticed that she had 3 piercings in each ear and it gave me some peace of mind to know that she had done this 6 times.......therefore I figured it couldn't be that bad. 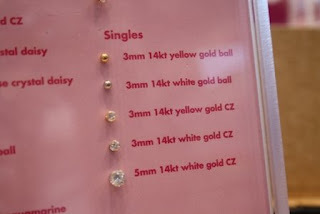 Joanne, Mary and I all decided to get the 3mm 14kt white gold earing. The excitement was building and I had butterflies in my stomach. Joanne went first. She did great. She was calm and cool. She didn't even flinch when they shot the gun and the earing flew through her ear. Next it was Mary's turn. She was also very relaxed. We were not allowed to take photos during the piercing. I am not sure why, but we did respect Sam's wishes. Finally it was my turn. I hopped up in the chair and posed for a few photos while Sam prepared the tools. 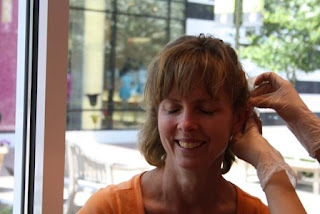 She place the little dot on my ear with a marker so we could make sure it was going to be where I wanted it. Mary and Joanne seemed fine with the placement and then.................WHAM! She rammed the earing through me ear and I couldn't believe how much it hurt. Joanne and Mary had totally fooled me into thinking that it wouldn't hurt at all. They sat in the chair so calmly when it was their turn. If you go back to our before photo you will notice that I had exposed my right ear for the piercing. In all the anticipation of the piercing, I ended up getting the wrong ear done. I just followed Joanne and Mary and did exactly what they did. Can you believe it.......I ended up piercing the wrong ear. Oh well, there was no way I was going to do it over again. After our visit to the mall we hit the road for our 3 hour drive home. My ear throbbed the entire time. It was red and felt very hot. Every couple of minutes I would get this sharp pain that felt like the piercing all over again. This was actually very tolorable compared to the pain I would later experince when trying to sleep. I think I woke up every 5 minutes when I rolled over onto the pierced ear. Almost a week later I am finally able to lay on that ear, only if I find the perfect spot. It looks like I might survive the whole ordeal afterall. A good friend made me a special card when she heard about the experience. I am not feeling the love....but I do love the card!